You want to fish on your non-fishing boat occasionally. A few tweaks make that imminently doable. Nothing beats really fresh fish as table fare. Not only does it taste terrific, cook easily and constitute some of the healthiest food you can eat, but your non-vegan guests will be totally impressed by your hunter-gatherer skills. Modern life is marked by hurry-up attitudes and high stress, so fishing represents a comparatively Zen pastime, forcing you to slow down and take the measure of and connect with nature. And it really doesn’t matter that you own a cruising boat rather than a purpose-designed fishing vessel. You can fish from it. It matters not what type or size boat you own, you can find rod holders to fit your needs at West Marine, Bass Pro, Cabela’s and many catalogs. Some need to be mounted to a bulkhead or gunwale with screws while others simply clamp to a Bimini top or a sunshade. Mount it so that the rod tip rests overboard to the side or aft on an angle between upright and 45 degrees. Any more level and a fish may pull it over the side. If you decide you like fishing enough, you can usually install DIY in-gunwale rod holders fairly easily. One easy possibility comes from Traxstech (traxstech.com). 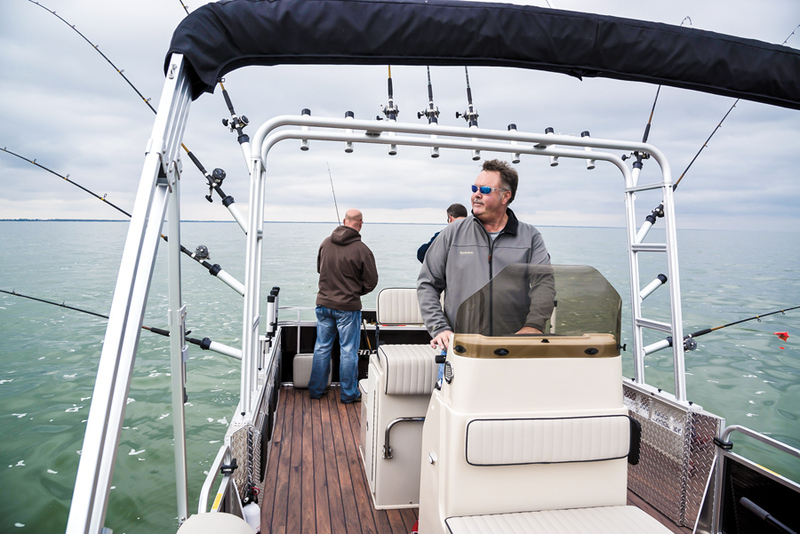 Screwing its simple tracks on the boat’s gunwales lets you mount all imaginable accessories, and remove them when not in use — from rod holders and bait tables to downriggers and outriggers to wine glass holders and barbecue grills. Store rods in your cabin (where you can securely lock them away when you head home) and around your cockpit in vertical rod racks. Again, both vertical and horizontal rod racks can be found at most boating supply stores, and their installation qualifies as an easy DIY project. Looking at photos of dedicated fishing boats can provide ideas for locations. Small fish that larger fish enjoy eating can be wicked effective as bait. But, you need a place to carry them so they don’t quickly die. A live baitwell needs circulating water. Portable bait tanks probably fit your needs best, as you can take them ashore, freeing up space when you aren’t fishing. Installing one may not be an easy DIY project, since you need a healthy water pump, a through-hull and a means of exhaust for the water to leave the tank (often the scupper works fine temporarily). Pick a well based on the size of the space in which you plan to use it. Make sure the tank is rounded — no sharp corners for the fish to bump into. Numerous manufacturers can fit your needs and price range. Even fanatical fishermen need to change tackle according to the fish they plan to target on a given day. Since most anglers qualify for an episode of “Hoarders,” it’s best to keep your variety of tackle at home and bring only what you’ll need. You can accomplish this with Plano tackle boxes, which are plastic containers that have adjustable compartments to accommodate lures, hooks, weights, swivels and everything else. If you have a cabinet or under-table space, you can build a small cabinet with compartments to hold these. However, every outdoor retailer carries tackle bags and boxes specifically designed to accommodate such boxes, and then you can just take it home when all you want to do is cruise. Virtually every marine multifunction display (MFD) includes a depthsounder. You can actually see fish — both big and small — on these, as well as the structure around which fish prefer to congregate. Check YouTube for lessons in what fish look like on such monitors, so you can find them yourself more readily. Cruising boats don’t usually have cockpits or aft decks designed for ease of fishing. In order to make your fishing expeditions more enjoyable (and productive), consider several things. 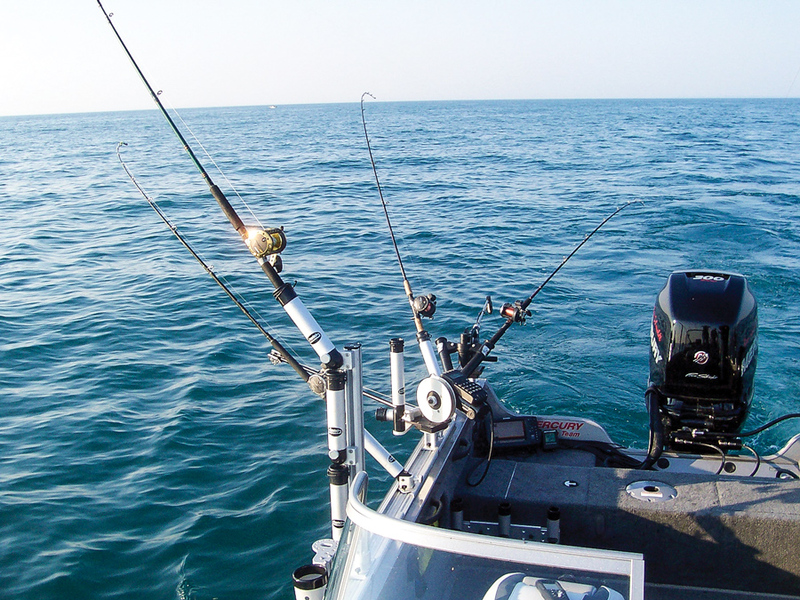 If move-about room comes at a premium, assign each angler a specific rod or area. That way, crew won’t need to move back and forth and get in each other’s way. You also need room to boat your catch. In other words, assuming you successfully hook a fish worth keeping and get it alongside the boat, you need to get it out of the water and onto the deck without losing it. To do so, you need a gaff or a net with a handle long enough to reach slightly below the water’s surface while you stand upright in the cockpit. Scan the depth contours along your course. If you see any spots that are significantly shallower or that suddenly deepen compared to the surrounding area, mark them. Fish like structure and food sources. Though not a hard and fast rule, you’re less likely to catch fish in deep water with no bottom or surface structure.